Rusty is beguiled already and he’s anxious to see the gorgeous Valeria for himself, even though nobody under 18 is allowed to see the show. Dwight doesn’t seem to be too keen on the idea at first, but deep down he is just as curious about Valeria as his friend is, and the two boys even have a bet about how ‘GORGEOUS’ she will be if they actually get to see her in the flesh. Just to make things a little more interesting, the loser of the bet will have to let Slim shave their head. Of course, they need to actually get to see Valeria in the first place, so they hike over to Janks’ Field, where the show is to be staged, in the hopes of catching a glimpse of Valeria before the show starts. And so begins their adventures. 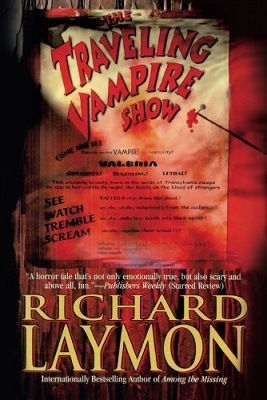 The Travelling Vampire Show is one of my favourite Richard Laymon Books. The action never stops and there are always plenty of things to keep you guessing right until the very end. Dwight is the central character and the story is told in his words as he remembers the summer when he was just sixteen, and Janks Field was the venue for a one-night vampire show. At its most basic, this is the story of three friends and what happens to them within the few hours between Dwight reading Rusty’s poster and their all too bloody encounter at the show later that evening. A lot happens in those few hours. Enough to fill 442 pages, in fact, and I was so enthralled I couldn’t turn those pages fast enough. This isn’t just a horror story about a travelling vampire show though. It is also a story about friendship and love and about growing up. There are adventures to be had, mysteries to be solved, and heads to be shaved. The characters in the The Travelling Vampire Show are quite complex and it would be hard not to like Dwight or Slim. Rusty is an interesting character too, but in a lot of ways he is the wild card of the group and neither Slim or Dwight can ever really rely on him to stand by them in times of trouble. He’s also selfish a lot of the time and has a few unusual habits, as Dwight discovers when he finds him going through Slim’s mother’s underwear drawer. Honestly, you just can’t take some people anywhere! Slim is a typically unique Laymon character. Her real name is Frances, but she doesn’t use it because ‘Frances is a talking Mule.’ She goes by many different names instead, depending on what book she happens to be reading at the time. She’s been Nancy, Holmes, Scout, Zock, Phoebe and Dagney; but on the day The Travelling Vampire Show comes to town, she’s Slim. What’s in a name though, and, call it any way that you want, she is probably smarter than Dwight and Rusty put together, as Dwight is quick to admit. Slim and Dwight have been friends for years, but the summer that The Travelling Vampire Show arrived in town was also the summer they found themselves staring into each other’s eyes a little longer than had previously been their norm. Dwight, Slim and Rusty are the main characters in the book, but there are plenty of other characters in the book who are every bit as interesting, and Laymon brings every one of them to life on the printed page, even if some of them don’t get to stay alive until the end of the book. I’ve read The Travelling Vampire Show twice, and even though it isn’t a story that I could ever forget, it was great to visit the book for the second time and I am sure it will be just as great the next time around too. I suppose that before I finish this review I should tell you who gets his head shaved in the end—Dwight or Rusty—Sorry, I’m not saying, but by the time the gang gets to see Valeria in the flesh they have a lot more at stake than just hair.